USA TODAY’s Kevin Allen breaks down the biggest story lines from the first night of NHL playoff games and looks ahead to what to look for in tonight’s action. PITTSBURGH – When Pittsburgh Penguins coach Mike Sullivan was trying to squeeze out enough playing time for two quality goalies this season, he asked them to embrace one rule in the name of keeping the peace. “As I said to them on many occasions, we don’t expect them to agree with the coach’s decision all of the time, but we do hope that they respect the coach’s decision,” Sullivan said. 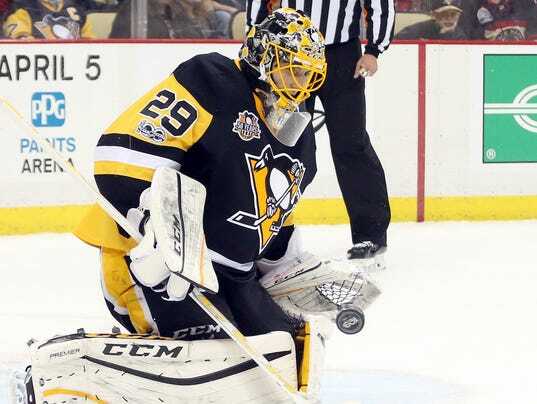 Sullivan’s effort to make a two-goalie system harmonious this season is already paying off in the playoffs because Marc-Andre Fleury, forced into action in Game 1 when Matt Murray was injured in the warm-up, will also start Game 2 Friday against the Columbus Blue Jackets. Sullivan’s only statement on Murray is that he has a lower body injury and there is “no time frame” for his return. “It really doesn’t change our game plan, especially with the people we have in goal,” Sullivan said.